Heat oil in 12-inch skillet or wok over medium-high heat until hot. Add broccoli, celery, carrots, onion and mushrooms; cook and stir 6 to 8 minutes or until carrots are crisp-tender. Add stir-fry sauce and pea pods; cook and stir 2 to 3 minutes or until sauce is bubbly and thickened. Serve over chow mein noodles. In a hurry? Choose pre-cut vegetables from the grocery store salad bar. Pick up the garnishes as well, such as roasted salted sunflower seeds and chopped green onions. 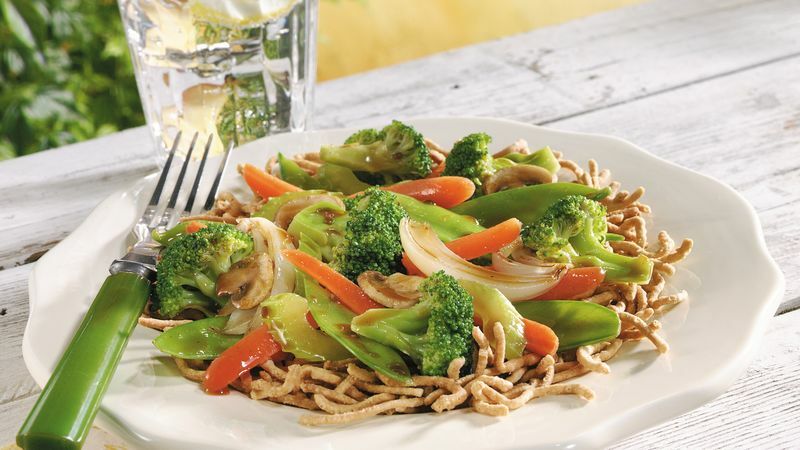 In this stir-fry, the flavors of celery and soy and the crunch of chow mein noodles will remind you of take-out chow mein, that ever-popular, American-Chinese original. Look for sesame-ginger stir-fry sauce in the Asian foods section of the grocery store. If you prefer a vegan sauce, read the labels carefully. Some stir-fry sauces are seasoned with fish or oyster sauce.